As you read this, billions of galaxies all across the Universe are crashing into each other. Sometimes one galaxy punches right through the center of another, creating a “Ring” or “Starburst” galaxy. One of my favorites is Arp 148, aka Mayall’s Object, seen above. It’s located in the constellation Ursa Major, approximately 450 million light-years away. The collision couldn’t be more graphic. 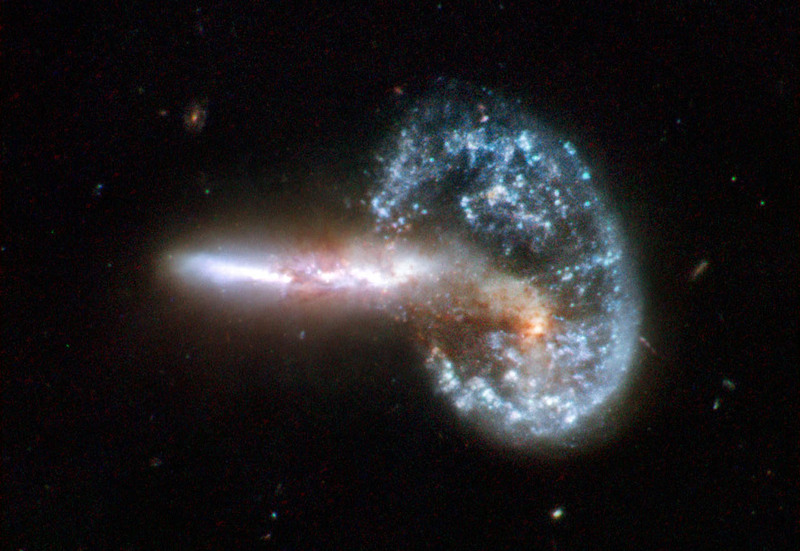 A cigar-shaped galaxy’s scored a direct hit on the center of a bright blue circular one. The brilliant color of the “target” galaxy” is caused by a collision shockwave that’s sparking new stars into life as it spreads out. Another amazing Starburst Galaxy is the Cartwheel Galaxy. It’s about 500 million light-years away from us in the Sculptor constellation. 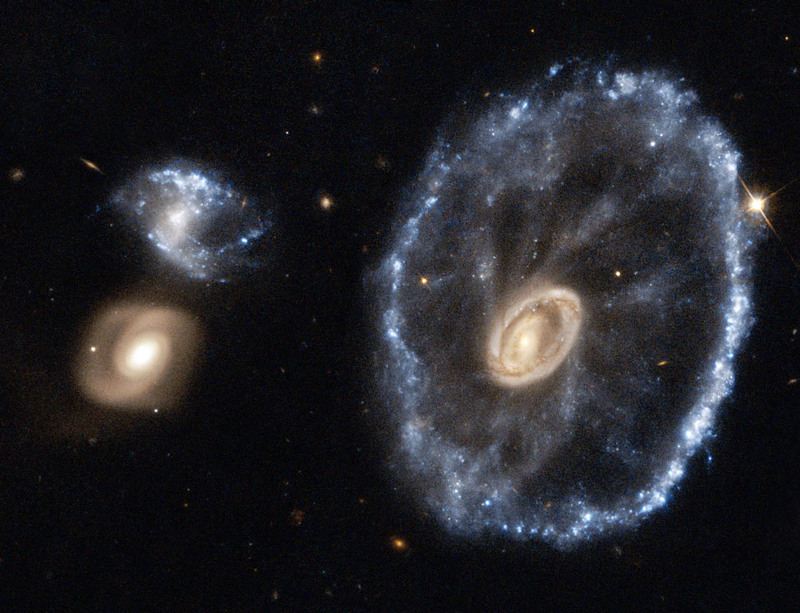 The Cartwheel Galaxy was a classic spiral galaxy until sometime between 100 million to 200 million years ago, when a second smaller galaxy blasted through its center. Just like Mayall’s Object, the impact set off a galactic shockwave that produced a brilliant blue star ring around the galaxy’s center that contains billions of newly minted stars. At the center of the collision point, we can see what remains of the original galaxy, a warm-toned complex spiral composed of older yellow stars. But what’s really remarkable in this picture is the two “child” galaxies on the left side of the image that were knocked loose by the force of the collision. One appears to be composed of older stars that came from the center of its spiral parent galaxy. The other is made up of fresh blue stars, probably created by the force released when the other parent scored its bull’s-eye. And finally, here’s Arp 284, a galactic mashup 100 million light-years away in the constellation Pisces. 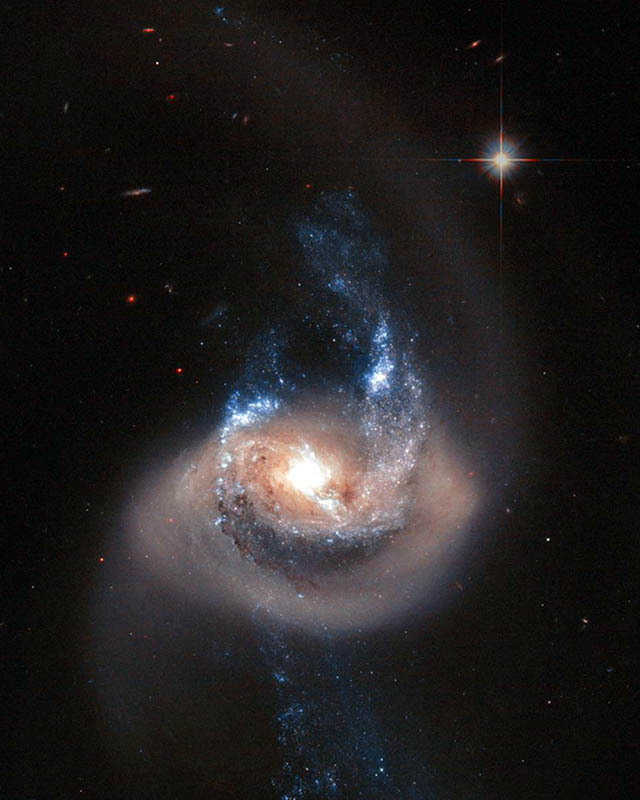 Arp 284 was created by the merger of two galaxies, NGC 7714 and NGC 7715. Rather than a “Ring” or “Starburst” galaxy, I think of Arp 284 as a “Splash” galaxy. There are a number of interpretations of Arp 284’s cosmic dynamics. No one’s certain exactly what’s going on. But regardless of what led up to the collision, there are some extraordinary elements to examine here. One is the torrent of newly-spawned blue stars that sprays in opposite directions from the merger’s epicenter. Millions of stars are splashing “up”, while millions more are splattering “down.” Equally interesting is the smoke-like mass of older yellow stars that flows in concert with the blue stars. The overall dynamics are reminiscent of a classic Harold Edgerton slow-motion photograph of what happens when a bullet blasts through an apple. Or perhaps a better analogy is the crazy splash you make when you dive-bomb into a swimming pool on a hot summer day.